Tacoma Planning Commission "Emphatically Urges the Council to Say No to Digital Billboards"
"[t]he Commission Emphatically Urges the Council to say no to digital billboards. Nearly 350 community members spoke against allowing this form of signage in our city. We understand the Council's reluctance for prolonged litigation and the laudable goal of ultimately reducing visual blight from existing billboards by instituting an exchange program, but the price to do so, as outlined in the settlement agreement, is too high." "The departure from this policy...would not only eliminate the amoratization provision but would also allow for new billboards that are digital, larger, and in areas where they have long been prohibited--does not mesh with the Commission's understanding of Tacoma's long-term vision to become a more attractive and liveable city." "We therefore are recommending that the sign code maintain the current limitations on traditional billboards and clearly prohibit digital billboards anywhere in the city." Now it is the time for the Council to do the right thing and follow the advice of Tacoma residents & the Planning Commission for the betterment of the city and ban blightful digital billboards as many other cities have! Make sure and attend the City City Council meeting tonight on the issue to support the billboard moratorium and/or contact the City Council members with your views. It appears our city manager (hired in mid-2005) decided in mid-2007 not to oppose Clear Channel's lawsuit challenging our 1997 city council's billboard ordinance, but decided instead to negotiate and compromise with Clear Channel. I am convinced, having carefully analyzed Clear Channel's court pleadings, that the city could have won that lawsuit quickly at little cost if it had engaged a capable lawyer to aggressively oppose Clear Channel. I explain why in my memorandum dated 5-13-2011 posted at cnc-tacoma.com/proposed-electronic-billb... near the bottom of that webpage just above the summary of relevant court cases. The city now should withdraw its settlement offer (that Clear Channel has never signed) and should begin enforcing our 1997 billboard ordinance. If Clear Channel files another lawsuit, the city should hire a capable lawyer to aggressively seek an early dismissal of that lawsuit. by L.S.Erhardt on 5/17/2011 @ 1:24am Either the city council is afraid, lazy or someone owns stock in Clear Channel. All three are unacceptable, and one might be criminal. Either way, the council better stand up to this or there will be hell to pay at the ballot box. by NineInchNachos on 5/17/2011 @ 1:31am we're seeing crazy conservatives and crazy liberals in the TNT threads in unanimous agreement on billboards. The love of blue sky, the love of seeing stars at night is truly a force to unify all people. "Please oppose the video billboard proposal, it would be a terrible blight on Tacoma. This is a bad settlement and you should reject it and continue to fight to clean up Tacoma." @RR: Yes. I have never ever seen Tacomans so universally lined up on one side of an issue. Nor have I seen Tacoma threatened with so much blight in a single vote. Tacoma Planning Commission members deserve a dozen golden City of Destiny medals for their valor in calling out the destructive proposals. @Thorax: imposing 24/7 commercial spam producing digital billboard on Tacomans would be perceived to be unconscionable to a very large majority of Tacomans. Yes, a difficult political plank to run on. RR keeps asking me - and everyone else - to boycott the Volcano. I finally responded, "RR, it would not be ethical for me to boycott a weekly alternative paper that featured a Mark Lindquist mask on their cover. What kind of ingrate would do that? Wyatt James would not. by cisserosmiley on 5/17/2011 @ 7:08am wow, mr matt driscoll makes the volcano sound like the "tnt" 3 or 4 years ago...this was on the eve of the great "tnt" boycott that resulted in the near dismantling of McClatchy's tacoma operation. will the volcano survive? what will we all do without the weakling barf? Why not? Maybe Clear Channel doesn't see this as a conflict of competing desires. For them it's about their business reason conflicting with the desire of a small group of Tacoman's. Reason vs. Desire. Economic Reality vs. Feelings. by Jesse on 5/17/2011 @ 7:52am "Here is another legal analysis from former Pierce County Prosecutor and former Tacoma City Councilmember John Ladenburg, Sr:"
Ladenberg Law advertises on a digital billboard on the north(?) side of I-5 as you are leaving Fife toward King County. Saw it with my own eyes yesterday... and laughed. by jenyum on 5/17/2011 @ 7:55am How does one boycott a free paper anyway? What if one needs something in which to wrap one's fragile items? by fredo on 5/17/2011 @ 8:00am That youtube posted by the urbanist is quite remarkable. I hope everyone will take 6 minutes out of their day to listen to it. by cisserosmiley on 5/17/2011 @ 8:10am hey jesse...i am sure the ladenbergs will dismiss this indescretion as ancillary...and since it takes place on tribal boards it is O.K.??? by NineInchNachos on 5/17/2011 @ 8:11am TNT link! 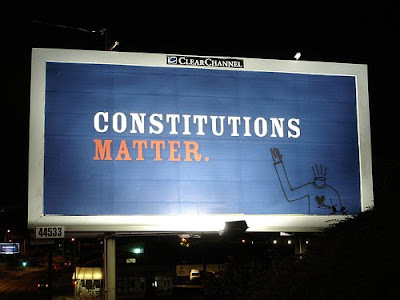 Are billboards educators or corruptors of society? Do they clarify or mystify the mind of the viewer? Maybe billboards are just man-made images, extensions of his authenticity, that provoke people to project their feelings---Billboards present Art now. Billboards for billboards sake. If that's the case then maybe billboards should be banned because they're emotionally exhausting and lead to mass confusion and skepticism about whether the true nature of reality can be known and how man should conduct himself. by NineInchNachos on 5/17/2011 @ 8:49am excellent youtube. Thanks Fredo. by NineInchNachos on 5/17/2011 @ 8:54am Beyond the Billboard is there a world you long to see? .... actually, NiN's link would probably do the trick in much less time. I fully support the moratorium proposed in this ordinance and appreciate the thoughtful approach this body along with the Planning Commission is taking in considering the issue of billboards in Tacoma. Overall this moratorium is less an action against billboards and more one for our city. Tacoma put in place reasonable guidelines related to billboards more than 14 years ago to which Clear Channel responded 4 years ago with a lawsuit. Unfortunately for them their non-compliance has, by my count, tallied their fine to over $32 million to date ( see www.feedtacoma.com/forum/tacoma-developm... ). Instead of working with our city they repeatedly threaten "costly litigation" as a scare tactic to urge us into settling. Precident brought forward by local legal opinions suggests that with hopefully minimal investment Tacoma can prevail in such a case and I, for one, support that investment. Cities change rules and ordinances all the time that sometimes financially impact business owners but do so, again, as an investment in bettering our community. The 1997 ordinance is no different. Just because the impact of it will solely fall on Clear Channel is no fault but theirs for having a local monopoly on outdoor advertising. As I've said before, I'm sure many other media companies (CBS, Virgin, etc.) would be happy to earn money on legally place billboards in Tacoma if Clear Channel would rather not. We owe little to a large company with it's own best interests in mind while we owe everything to the citizens who have been outspoken and nearly unanimous on this issue. Again, I completely support the courage of this Council in passing Ordinance No. 27982 and further encourage them to fight for the enforcement of the lawful 1997 ordinance. by Erik on 5/17/2011 @ 1:09pm Great email Kevin. Keep the fine meter alive!